Sometimes internal injuries or the presence of foreign bodies inside the patient requires foreign bodies inside the patient requires physicians to perform surgery. Based on principles similar to those used by multipurpose gravitonic effectors (MGE), exoscalpels are the 25th-century surgical cutting device. This unit uses trionic emitters to tightly focus a low-powered rapid nadion cutting beam. Exoscalpels have two modes of operation. In the normal mode an exoscalpel projects a linear nadion beam that functions as an exceedingly thin blade. A surgeon can focus the beam as short as 0.1 cm or as long as 20 cm for exceptionally deep incisions. The trionic emitters can also focus the nadions at certain points along the beam. 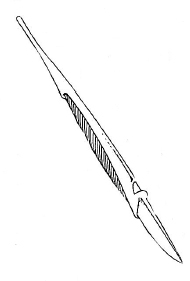 Since only focused nadions can slice tissue, an exoscalpel can cut deeply within a patient without actually piercing the skin or damaging any tissue between the exoscalpel and the affected region. This focused cutting area can extend up to 20 cm away from the unit and can focus as short as 0.1 cm or as long as 5 cm. If the surgical procedure requires it, a strong electronic charge carried by the trionic beam can instantly cauterize any incision this device makes. Like many instruments, exoscalpels have alternate uses. While this device is incapable of affecting refractory materials like tritanium of duranium, an exoscalpel can easily cut all ordinary organic material like wood or bone, and most of the boronite whisker composites used in furniture and clothing. When used as a weapon an exoscalpel inflicts between 1 and 3+2d6 points of damage.